Last week we introduced you to the design of our DIY electric bike (Building an Electric Bike, Part 1). We showed you how you could add electric power to a normal bike and the simple control system that allows both performance and regenerative braking modes. (If you’re coming to this article first, it won’t make much sense without starting at the beginning of the series!) This week we build the bike, starting with the motor. In this design, the motor cops a caning. But the approach works very, very well. Cheap, too. Basically, what we do is to use an excellent quality, nominally 12V motor - and often run it at 24 volts! Aaaagghhhhhh! I can hear all the design engineers sputtering. You may get theoretically four times the power, but what about the heat? What about the bearings? What about....? Three points. The first is that data-logging the current flow to the motor shows that typically it’s drawing less than it would under high loads on 12V. Secondly, when it is drawing very high currents, it’s usually only for a short time. And the third point? 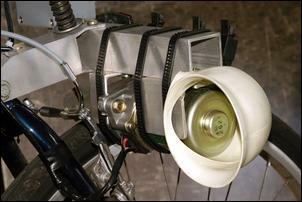 We dramatically improve the motor’s cooling. 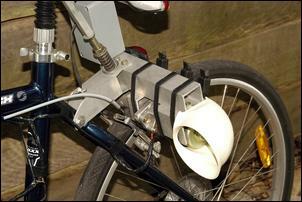 The motor that’s used in the bike is from a Honda electric power steering system. More and more small cars are running electric power steering and the motors are beautifully made, high torque designs. 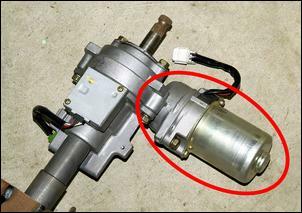 As said previously, the motor shown here was sourced from the tip (the complete electric steering rack was a warranty cast-off from a Honda dealer - no, I’ve never been able to find what’s supposed to be wrong with it) but similar motors can be obtained from Japanese importing wreckers. When looking for a motor, aim for an ‘orphan’: a steering rack imported with perhaps the front half of a car - the engine in the half-cut suitable for local models but the electric steering rack an unknown. In most cases, the output shaft of these motors uses a worm that drives a spur gear. What we do is cut away part of the output gearbox casting so that the worm itself can be pressed against the tyre tread. (In fact we replace the worm with a roller but we’ll come back to that in a moment.) So in addition to looking for a good quality 12V motor, also assess the shape of its output housing. It’s even better if the shaft is supported at both ends with roller bearings, but in some cases only plain bearings (eg bronze bushes) are used. If you do score an electric power steering motor, there’s another advantage - many have an electric clutch built into the assembly. Disconnect power and the output shaft turns freely; apply power and the shaft is locked to the motor. This function gives better motor-off performance as the bike wheel is spinning just the roller and a short section of shaft, rather than driving the whole motor. Either by unbolting an extension housing or by pulling the armature out of the motor, you should be able to gain full access to the worm. Originally, I created the roller by forcing heavy-duty rubber hose over the worm. This was quiet and initially effective, but once the hose-roller got hot, the rubber was quickly destroyed. On the flat, the rubber hose roller may last very well - and it’s certainly the easiest way of turning the worm into a roller that can bear against the tyre tread. However, in this case, a metal roller had to be placed over the worm. While initially I thought it would be a requirement that the roller be knurled (ie have ‘grip’ marks machined into it), the friction between even a smooth roller and the tyre is OK - especially on flat roads. How you turn the worm into a metal roller is up to your ingenuity - I ended up using a drilled-out 10mm deep-style socket surrounded by a roller salvaged from the output shaft of a stepper motor. The roller was slipped over the top of the socket, being held in place with a grubscrew. However, when I realised I just loved riding this electric bike, I decided to remove my (relatively) bodged-up roller and have a small machine shop turn-up a new shaft, complete with knurled roller. This cost AUD$140. 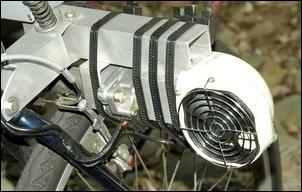 Lots of home-brew electric assist bikes use wheelchair or automotive windscreen wiper motors, complete with the worm drive gearbox. Typically, the output gear drives the chain. 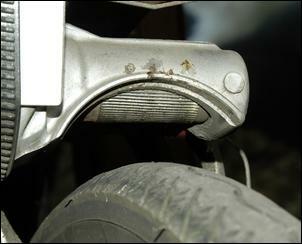 However, a downside of this approach is that regenerative braking cannot occur - very few worms will drive backwards. The relationship between the ‘natural’ speed of the motor, the available motor power, and the diameters of the roller and the tyre will determine the on-the-flat cruising speed. If the on-the-flat cruising speed is too slow, increase the diameter of the roller. 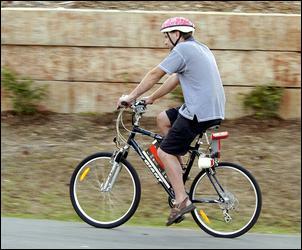 If it is too fast (or more likely, your hill-climbing ability is really bad), decrease the diameter of the roller. Changes in roller diameter are easily tested by using different diameter rubber hoses - even if the roller life is short, it will give you a guide to the outcome. Note that mountain bike knobbly tyres should be replaced with smooth highway tyres - they’re available for wide mountain bike rims but you might have to scout around a few shops to find them. If you want to get very tricky, it’s possible to replace the cylindrical roller with one shaped like a cone. If the motor and cone-shaped output roller are moved laterally across the tyre, the gear ratio of the drive system can be steplessly varied. The motor’s output roller needs to be held rigidly at right-angles to the tyre tread. Further, it needs to be pushed down into the tyre so that the tyre and roller have a good frictional grip on one another. 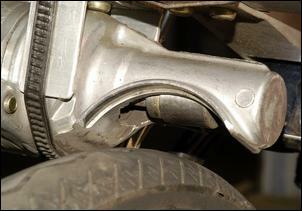 It also helps if existing holes in the bicycle frame are used. The roller pressure on the tyre is maintained by the use of an extension piece of smaller aluminium tube that goes to the underside of the seat, a threaded bolt and a stiff compression spring. Lots of testing showed that the motor could get really hot after long, very steep hills. (In these conditions the bike speed is down to 10 km/h or so and I’m pedalling in 1st or 2nd gear of 21 speeds.) To stop the motor getting so hot, a cooling air scoop was then added. It’s made from a 75mm stormwater pipe plastic elbow that was cut, heated and bent to form the required shape. The scoop dropped moving motor temps a lot but if the bike was stopped after climbing a long hill (or descending it, where regen braking loads the motor), the external casing rose in temp to 55 - 60 degrees C. To stop this temp increase, a PC cooling fan was integrated into the scoop. It runs off just one of the 12V batteries (its current load is tiny) and is triggered by a thermostatic switch mounted on the motor. The fan comes on at 57 degrees C and switches back off at 48 degrees C. The switch was salvaged from a dishwasher. On hot days the fan operates when the bike is moving, but in most cases it switches on only when the bike has come to stop. In this situation it runs for 10 or so minutes. Next week: the batteries, and riding the bike!